Nerfs to Maokai this patch means that top lane is ready for a new dominant champion. There's a new player in the Top Lane God Tier, and you'll have to scroll down to find out who (it's not Leblanc). Meanwhile, nerfs on Jhin and Corki also open up bot and mid lane to changes, but it looks like the usual suspects are back in action. Where's Cho'Gath in all this? Mostly hanging out in status quo, as the rework ended up a bust for this hairy bugger. Nerfs to Maokai this patch means that top lane is ready for a new dominant champion. 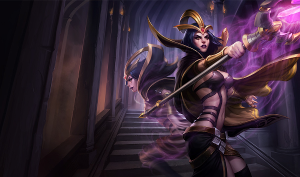 There's a new player in the Top Lane God Tier, and you'll have to scroll down to find out who (it's not Leblanc). Meanwhile, nerfs on Jhin and Corki also open up bot and mid lane to changes, but it looks like the usual suspects are back in action. Where's Cho'Gath in all this? Mostly hanging out in status quo, as the rework ended up a bust for this hairy bugger. Camille [Tier 1 Top] - Camille's currently a state where she's relatively balanced, resulting in far fewer bans. Now players are beginning to play her more often and are discovering additional combos and new mechanics. As a result, she's slightly stronger than she was directly after her nerf, but nowhere near broken or unplayable. Feel free to pick her up if you like her flashy playstyle! Cho'Gath [Tier 3 Top] - Cho's rework was relatively tame, and although he has the potential for infinite stacks, getting tankier doesn't necessarily prevent him from getting annihilated by three item carries as his damage isn't abusive enough to survive kiting. He's difficult to lane against for certain champions, but his overall game impact remains limited, even when he gets ahead as a result of powercreep. Corki [Tier 2 Mid] - Riot nerfed Corki quite hard this patch by reducing his Missile Barrage [R] damage significantly, and also giving enemy laners the ability to foresee when he has his Big One ready for massive burst. This greatly reduces his ability to safely outplay, and thus reduces his overall effectiveness. Graves [Tier 1 Jungle] - After the Youmuu changes, Graves is still plenty strong, but Black Cleaver is performing better on him. Kled [God Tier Top] - SSJSuntastic's getting aboard the sleeper pick hype train again with the young Kled top in God Tier. As an extremely tanky champion combined sporting amazing synergy with Fervor of Battle (recently buffed), Kled is very abusive in the top lane. This leads into an extremely dominant mid to late game team fighting ability, and he easily runs down enemy champions for free kills. Maokai's nerfed, lethality's nerfed, Black Cleaver's buffed, and Kled top is ready to run the show. Maokai [Tier 2 Top] - The nerf on Maokai's sapling waveclear absolutely crushed his lane dominance ability, and they gave him a little love tap on his Arcane Smash [Q] mana cost to make sure his early game under turret really suffers. Mordekaiser [Tier 1 Top] - Mordekaiser is another one of those sleeper picks that nobody really understands. His trading power is phenomenal, and if he can roam bot and pick up dragon, that can easily snowball into turrets and additional objectives to throw the game wide open. Shaco [God Tier Jungle] - The sweeper changes on his boxes was actually a very large buff for him, as he can now drop boxes during fights with sweepers activated and still have them pop off. This also allows him to use his boxes for zoning, even when the enemy runs through with sweeper on their way to Baron/Dragon. Yorick [Tier 1 Top] - Yorick plays somewhat similar to Illaoi in that landing his Mourning Mist [E] spells complete disaster for the enemy laner. His ability to deal massive damage is very underrated, and for some reason many people still don't know how to get out of his Dark Procession [W]. This results in longer than average crowd control durations as they struggle to escape.